Jeremy Maclin (born May 11, 1988) is a former American football wide receiver. He played college football at Missouri, where he was a two-time consensus All-American, and was drafted by the Philadelphia Eagles in the first round of the 2009 NFL Draft. He also played for the Kansas City Chiefs and Baltimore Ravens, making a Pro Bowl appearance in 2014 with the Eagles. He retired in 2019. Maclin was born in Kirkwood, Missouri. He attended Kirkwood High School in Kirkwood, Missouri from 2002 to 2006, where he was a letterman in football and basketball. Maclin attended the University of Missouri, where he played on coach Gary Pinkel's Missouri Tigers football team from 2006 to 2008. He played as a wide receiver, punt and kick return specialist for the Missouri Tigers in 2007 and 2008. He holds the NCAA freshman record for most all-purpose yards in a single season. His yardage totals in four categories were: 307 punt returning, 375 rushing, 1,039 kickoff returning, and 1,055 receiving for a total of 2,776 yards; an average of 198.3 yards per game in his 14 games. Maclin was named as a consensus first-team All-American as a wide receiver and as an All-Purpose player. Maclin, paired with Heisman Trophy finalist quarterback Chase Daniel, helped lead the Missouri Tigers to a 12-2 record and victory in the 2008 Cotton Bowl Classic. Maclin also gained All-America selections on various other teams as a kick returner. He finished his All-American season with 80 receptions and 16 touchdowns. Maclin began his second season with the Tigers with high expectations and possible consideration for the Heisman Trophy. In the Tigers’ season-opener against the Illinois Fighting Illini, he returned a kickoff for a touchdown but left the game with an ankle injury. He had four receptions for 31 yards and a touchdown. The next game, against Southeast Missouri State, Maclin caught only two passes for 20 yards and a touchdown. Maclin was also involved in a trick play, however, in which quarterback Chase Daniel lined up at wide receiver and Maclin lined up at quarterback. Maclin threw a lateral to Daniel, who threw down field for a touchdown. Maclin recorded six receptions for 172 yards and three touchdowns against Nevada. Maclin led all of major-college football in all-purpose yards per game with 202.36 (2,833 yds. in 14 games), over 15 yards more than second-place Jahvid Best (187.25) of California. He had 1,260 receiving, 1,010 kickoff return, 293 rushing, and 270 punt returns yardage for 2,833 all-purpose yards. Maclin was named to the Associated Press All-American as a wide receiver, and he was once again named to the first-team as the All-Purpose player. 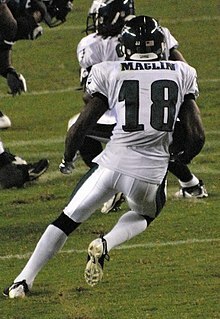 Maclin was a unanimous pick in 2007 for the same position as a freshman. 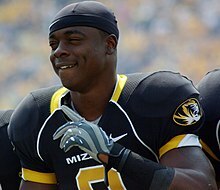 Maclin was considered a top National Football League prospect following his second season at Missouri, and roommate Sean Weatherspoon hoped to convince Maclin to return for his junior year instead of leaving Missouri for the 2009 NFL Draft. Weatherspoon's efforts were unsuccessful, and on January 9, 2009, Maclin declared for the 2009 NFL Draft. Draft analyst Mel Kiper Jr. projected Maclin to go to the Oakland Raiders with the tenth pick in the first round of the NFL Draft, but that was after Michael Crabtree, another highly regarded prospect at wide receiver, measured in at 6'1", two inches shorter than his published height. Crabtree also suffered a broken bone (Jones fracture) in his left foot prohibiting him from working out at the NFL Combine. Maclin's personal best in the 40-yard dash was 4.31 seconds, but he wanted to lower that to 4.29 seconds in the NFL Scouting Combine in Indianapolis. He tripped and fell during a passing drill at the NFL Scouting Combine on February 22, 2009, hyperextending his left knee, and wasn't running at full speed, but previously to his fall, unofficially ran the 40-yard dash in 4.34 seconds and 4.4 seconds that morning. He ran the 40-yard dash at the NFL Scouting Combine in 4.45 sec., but the earlier unofficial times conflicted with other reports that said he ran the dash first in 4.34 seconds and then 4.44 seconds. After originally believing he had to get an MRI on his injured left knee, it was reported he would not need one as the knee was healthy by the end of the Combine. He also had a sore right hip because of the fall, but that also proved to be minor. Maclin scored very high for a wide receiver on the Wonderlic Test with a score of 25, compared to the normal score of 18 for wide receivers. Maclin dropped further than expected in the Draft, but was eventually chosen by the Philadelphia Eagles in the first round with the 19th overall pick. Maclin was the third receiver to be selected in the draft, behind Darrius Heyward-Bey, who went seventh overall to the Oakland Raiders, and Michael Crabtree, who went tenth overall to the San Francisco 49ers. On August 3, after eight days of disagreements with the Eagles front office, Maclin signed a five-year, $15.5 million deal ($9.5 million guaranteed). Maclin started in his first NFL game on September 27, 2009, against the Kansas City Chiefs in week 3 in place of the injured Kevin Curtis. He caught four passes for 33 yards in that game. On October 11, 2009, Maclin scored his first NFL career touchdown on a 51-yard reception from Donovan McNabb as the Philadelphia Eagles beat the Tampa Bay Buccaneers 33-14. Maclin also recorded his second NFL touchdown reception later in the game. On December 27, 2009, in a home game against the Denver Broncos and with the score tied 27–27, Maclin made a decisive catch on the sideline to extend a crucial late drive for the Eagles. McNabb threw a tight spiral to the sideline and Maclin caught it while toeing the line. Initially the catch was ruled incomplete, but upon further review was ruled a catch and first down. Three plays later, Eagles kicker David Akers kicked the game-winning field goal, sealing victory for Philadelphia by a score of 30–27. Maclin finished with 6 catches for 92 yards. For this he received Rookie of the Week honors. On January 9, 2010, in the Eagles’ NFC Wildcard game against the Dallas Cowboys, Maclin became the youngest player to score a touchdown in NFL postseason history, aged 21 years and 243 days. In the second quarter, he caught a 76-yard touchdown pass from Michael Vick, which was the longest career touchdown pass of Vick's career and Maclin's longest career touchdown catch. With 146 yards, Maclin broke the Eagles record for receiving yards in a playoff game, breaking Keith Jackson's record of 142 yards set during the 1988 NFC Divisional Game against the Chicago Bears. On August 3, 2010, Maclin was carted off the training camp practice field with a leg injury. Further evaluation showed that he suffered a bone bruise. Maclin returned to the field later in the season to catch 70 passes for 964 yards the longest for 83 yards. He also scored 10 touchdowns. In the 2010 season, Maclin led the league in Red Zone receiving touchdowns with 7, tying New York Giants wide receiver and NFC East rival Hakeem Nicks. He also rushed for 36 yards on 3 carries, making his combined rushing and receiving total exactly 1,000 yards. Maclin was placed on the active/non-football illness list on August 3, 2011. On August 5, head coach Andy Reid said that he expected Maclin to be healthy for the regular season. It was revealed on August 17 that Maclin was held out of training camp because of a lymphoma scare. An inflammatory virus was determined as the cause of the symptoms he showed and he did not have cancer. He was activated from the active/non-football illness list on August 27. In Week 2, Maclin caught 13 passes with 171 yards and 2 touchdowns but lost to the Atlanta Falcons by a score of 31-35. Overall, he finished the 2011 season with 63 receptions for 859 receiving yards and three receiving touchdowns. During the 2012 season, Maclin recorded 69 receptions for 857 yards and seven touchdowns. He had a season-high 130 receiving yards and a receiving touchdown in a 26–23 overtime loss to the Detroit Lions in Week 6. On July 27, 2013, Maclin suffered a torn ACL during training camp and was forced to miss the entire 2013 season. On July 30, 2013, Maclin was officially placed on the injured reserve list. On February 28, 2014, it was announced that Maclin would sign a one-year deal that will keep him on the Eagles roster throughout the 2014 season. The deal was for $6 million with $3.5 million guaranteed. Since the release of DeSean Jackson, as well as a disappointing season by 2013 starter Riley Cooper, Maclin's role on the team had increased as the first-choice receiver. In Week 3, against the Washington Redskins, he had eight receptions for 154 receiving yards and a touchdown in the 37–34 victory. In Week 8, against the Arizona Cardinals, he had a season-high 187 receiving yards and two touchdowns in the 24–20 loss. He followed that up with 158 receiving yards and two receiving touchdowns in the 31–21 victory over the Houston Texans. He led the team in yards (1,318) and receptions (85), both career highs, as well as touchdowns (10), through the 2014 NFL season. He also had no fumbles for the first time since 2009. On January 16, 2015, Maclin was added to the Pro Bowl as an alternate replacing an injured Denver Broncos wide receiver Demaryius Thomas. He was ranked 61st by his fellow players on the NFL Top 100 Players of 2015. On March 11, 2015, Maclin signed a five–year, $55 million contract with the Kansas City Chiefs. Maclin started out slow, but had eight receptions for 141 yards in a Week 3 matchup against the Packers, where he became the first Chiefs wide receiver to catch a touchdown pass since 2013. Although he slowed down at midseason, he bounced back, catching for 160 yards and a touchdown in a Week 12 matchup against the Bills, followed by 95 yards and 2 touchdowns against the Oakland Raiders. He finished strong, catching a touchdown in the last three games of the season. He finished the season with a career-high 87 catches for 1,088 receiving yards and eight touchdowns. The Chiefs, who had gone 11-5 after winning 10 straight, advanced to the playoffs. In a 30-0 shutout of the Houston Texans, Maclin started out slow, but started to get into a rhythm in the 3rd quarter, with 3 catches for 29 yards, before he suffered a high ankle sprain that kept him out for the rest of the game. Maclin, who many thought wouldn't play at all against the New England Patriots in the divisional round, was listed as active, but he played very limited snaps and was taken out almost entirely after the first half, finishing with 2 catches on 3 targets for 23 yards. Maclin was ranked as the 93rd best player in the NFL by his fellow players on the NFL Top 100 Players of 2016. Hampered by a torn groin, Maclin missed four games in the 2016 regular season. He started only 12 games for career lows of 44 receptions, 536 yards, and two touchdowns. On June 2, 2017, Maclin was released by the Chiefs. On June 13, 2017, the Baltimore Ravens signed Maclin to a two-year, $11 million contract, which includes $6 million the first year. On September 10, in the season opening 20–0 victory over the Cincinnati Bengals, Maclin, in his Ravens debut, recorded his first touchdown with the team, which was a 48-yard reception from quarterback Joe Flacco. He finished the season with 40 receptions for 440 yards and three touchdowns. On March 14, 2018, Maclin was released by the Ravens. On March 24, 2019, Maclin announced his retirement. While with the Philadelphia Eagles, Maclin was a resident of West Deptford Township, New Jersey. On May 20, 2017, Maclin married Adia Kuzma. ^ "Jeremy Maclin Gives Back to Kirkwood". FOX2now.com. July 21, 2015. Retrieved August 30, 2018. ^ "Surrogate Family Nurtures a Star". New York Times. Retrieved August 30, 2018. ^ "Jeremy Maclin College Stats". College Football at Sports-Reference.com. Retrieved August 30, 2018. ^ Henry, Jim. "Jeremy Maclin Is Special". AOL Sports Blog. Retrieved December 21, 2010. ^ "Five Tigers Named to AP All-America Teams". Missouri Official Athletic Site. December 15, 2010. Retrieved December 21, 2010. ^ "2007 Missouri Tigers Schedule and Results". College Football at Sports-Reference.com. Retrieved August 30, 2018. ^ "2008 Cotton Bowl, Missouri vs Arkansas". MSN.com. Retrieved August 30, 2018. ^ "Missouri whips Illinois, but WR Maclin is injured". The Denver Post. August 30, 2008. Retrieved August 30, 2018. ^ "Mizzou's WRs did something Saturday that hadn't been done since 2008". Saturday Down South. September 3, 2016. Retrieved August 30, 2018. ^ "Missouri Tigers' Jeremy Maclin to announce NFL plans on Friday". St. Louis Post-Dispatch. January 8, 2009. ^ "University of Missouri Athletics - The Fifth Down. The Flea-Kicker. 4.8 Seconds. The page you wanted". mutigers.cstv.com. ^ "Jeremy Maclin - Career Statistics". Missouri Football. Retrieved January 9, 2009. ^ "Maclin to reveal his future Friday". ESPN.com. Retrieved January 8, 2009. ^ "Sean Weatherspoon coming back; Jeremy Maclin unsure". St. Louis Post-Dispatch. December 30, 2008. Archived from the original on March 26, 2009. Retrieved January 7, 2009. ^ "Maclin Declares for NFL Draft: Tiger enters name into draft-eligible pool". University of Missouri Official Athletic Site - Missouri Athletics. January 9, 2009. Retrieved January 10, 2009. ^ Bill Coats (January 10, 2009). "Missouri Tigers receiver Jeremy Maclin opts for NFL draft". St. Louis Post-Dispatch. Retrieved January 10, 2009. ^ Reid Laymance (January 9, 2009). "MU receiver Jeremy Maclin opts for NFL draft". St. Louis Post-Dispatch. Retrieved January 10, 2009. ^ "Mel Kiper's 2009 NFL mock draft". ESPN. January 22, 2009. Retrieved January 22, 2009. ^ "Maclin gains ground". St. Louis Post-Dispatch. February 22, 2009. ^ "Mizzou standout Maclin has nothing to hide at Combine". St. Louis Post-Dispatch. February 20, 2009. Archived from the original on February 25, 2009. ^ "2009 NFL Combine Results: Wide Receivers". Fantasy Football Toolbox.com. Retrieved February 24, 2009. ^ "Updated 40-Yard Dash Times". The National Football Post. February 22, 2009. Archived from the original on February 25, 2009. Retrieved February 24, 2009. ^ Jim Thomas (February 24, 2009). "No MRI for Missouri wide receiver Maclin after all". St. Louis Post-Dispatch. Retrieved February 25, 2009. ^ "Jeremy Maclin, 2009 NFL Draft Scout Player Profile". NFL Draft Scout. February 24, 2009. ^ "*Jeremy Maclin, DS #2 WR, Missouri". Nfldraftscout.com. Retrieved January 30, 2010. ^ "Sep 16, 2009, p. 7". Clovis News Journal. Retrieved August 30, 2018. ^ "2009 NFL Draft Listing". Pro-Football-Reference.com. Retrieved August 30, 2018. ^ "Signing status of 2009 NFL Draft first-round picks". NFL.com. ^ Grotz, Bob. "Maclin ready to make most of first start with Eagles". The Delaware County Daily Times. Retrieved August 30, 2018. ^ Maaddi, Rob. "McNabb, Eagles manhandle Buccaneers, 33-14". The Delaware County Daily Times. Retrieved August 30, 2018. ^ "David Akers' field goal leads Eagles past Denver". The Denver Post. December 27, 2009. Retrieved August 30, 2018. ^ "Vick strikes early with 76-yard TD pass". ESPN.com. Retrieved August 30, 2018. ^ "Eagles WR Jeremy Maclin hyperextends knee, carted off practice field". USA Today. August 3, 2010. ^ "Maclin Happy Injury Wasn't Severe". Philadelphia Eagles. August 5, 2010. Retrieved December 21, 2010. ^ "Fantasy Football Jeremy Maclin". CBSSports.com Fantasy News. December 17, 2010. Retrieved December 21, 2010. ^ "Jeremy Maclin 2010 Game Log". Pro-Football-Reference.com. Retrieved August 30, 2018. ^ Glazer, Jay (August 17, 2011). "Maclin's cancer test results are negative". Fox Sports. Retrieved August 17, 2011. ^ Odum, Charles. "Kafka, Eagles fall to Falcons, 35-31". sandiegouniontribune.com. Retrieved August 30, 2018. ^ "Jeremy Maclin 2011 Game Log". Pro-Football-Reference.com. Retrieved August 30, 2018. ^ "Jeremy Maclin 2012 Game Log". Pro-Football-Reference.com. Retrieved August 30, 2018. ^ "Lions Tear Apart Eagles in Overtime". NBC 10 Philadelphia. Retrieved August 30, 2018. ^ "Eagles WR Jeremy Maclin tears ACL". USA Today. July 27, 2013. ^ McPherson, Chris (July 30, 2013). "Jeremy Maclin Placed On Injured Reserve". PhiladelphiaEagles.com. Retrieved July 30, 2013. ^ David Smith, Michael. "Eagles, Jeremy Maclin agree to one-year deal". Pro Football Talk. Retrieved February 28, 2014. ^ "Matthews, Maclin lead Eagles over Redskins". Herald-Mail Media. Retrieved August 30, 2018. ^ Fierro, Nick. "Cardinals stun Eagles with late scoring bomb". themorningcall.com. Retrieved August 30, 2018. ^ "Eagles' Sanchez, Maclin too hot for Texans' secondary to handle". Houston Chronicle. November 4, 2014. Retrieved August 30, 2018. ^ "2014 Philadelphia Eagles Statistics & Players". Pro-Football-Reference.com. Retrieved August 30, 2018. ^ "Jeremy Maclin, Jon Dorenbos added to Pro Bowl". ESPN.com. Retrieved January 16, 2015. ^ "'Top 100 Players of 2015': No. 61 Jeremy Maclin". NFL.com. Retrieved August 30, 2018. ^ "Packers drill Chiefs 38-28 on 'Monday Night Football'". kansascity. Retrieved August 30, 2018. ^ "Chiefs' Jeremy Maclin: 160 yards and TD in win". CBSSports.com. Retrieved August 30, 2018. ^ "Chiefs intercept Raiders' Carr 3 times in win". Newsday. Retrieved August 30, 2018. ^ "Jeremy Maclin 2015 Game Log". Retrieved August 30, 2018. ^ "'Top 100 Players of 2016': No. 93 Jeremy Maclin". NFL.com. ^ "Maclin reveals he tore his groin last season - Rotoworld.com". Rotoworld.com. ^ "Jeremy Maclin 2016 Game Log". Pro-Football-Reference.com. Retrieved August 30, 2018. ^ Shook, Nick (June 2, 2017). "Chiefs release wide receiver Jeremy Maclin". NFL.com. ^ Orr, Conor (June 13, 2017). "Jeremy Maclin signs two-year, $11M deal with Ravens". NFL.com. ^ "Baltimore Ravens at Cincinnati Bengals - September 10th, 2017". Pro-Football-Reference.com. Retrieved September 14, 2017. ^ "Jeremy Maclin 2017 Game Log". Pro-Football-Reference.com. Retrieved August 30, 2018. ^ Wesseling, Chris (March 14, 2018). "Jeremy Maclin released by Baltimore Ravens". NFL.com. ^ Bergman, Jeremy (March 24, 2019). "Ex-Eagles WR Jeremy Maclin retiring after 10 years". NFL.com. ^ "Jeremy Maclin Stats". ESPN Internet Ventures. Retrieved March 18, 2014. ^ Lombardo, Matt (April 13, 2015). "Look inside former Eagles wide receiver Jeremy Maclin's N.J. home, which is up for sale (PHOTOS)". NJ Advance Media. Retrieved October 25, 2015. ^ Rapp, Timothy (May 22, 2017). "Jeremy Maclin, Adia Kuzma Wedding: Attendees, Photos and Details". BleacherReport.com. Retrieved June 13, 2017. Wikimedia Commons has media related to Jeremy Maclin.